Isaac Hayden has revealed how he'll react if he's denied a move in this month's transfer window. Hayden informed the club last summer that he wanted to leave to be closer to his infant daughter. Rafa Benitez blocked a move, and the midfiedler restated his keenness to leave this month. Aston Villa are understood to be interested in Hayden, who will only be allowed to leave before tonight's transfer deadline if the club signs another midfielder. 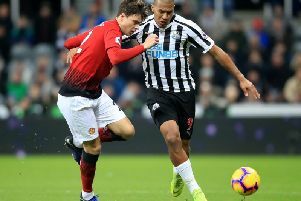 However, a move for Benfica's Andreas Samaris has reportedly stalled, and Hayden could have to see out the season at St James's Park. Speaking after last weekend's FA Cup defeat to Watford, Hayden said: “It is what it is – I can’t change it. "It’s up to the football club. We’ve had ongoing discussions, and there’s only five days left now. The clubs that are interested in me are waiting, and the clubs that I want to go to are waiting. "It’s just a case of whether Newcastle say ‘yeah, you can go’. If they say that, I can go. That’s where it is, really. "Whatever happens, I’m just going to enjoy playing football and work as hard as I can in training and in the games. That’s all I can do. "If it’s not in January, then we’ve got three months until the end of the season and I’ll give 100% if I’m called upon. If I’m not, then I’m not."